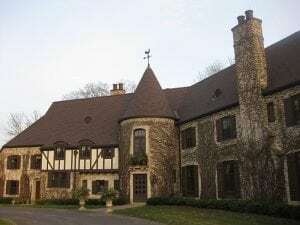 Throughout the years, television and movies have romanticized the look of French Country architecture. The style first became popular in North America in the 1920s and 1930s, and remains a mainstream motif for new homes, including timber frame homes, today. After World War I, soldiers stationed in France returned and began building homes resembling the countryside manors they saw. 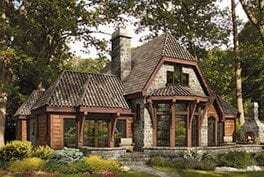 What became known in North America as French Country architecture is actually a blend of rural home styles from many different provinces in France. The styles range from formal to rustic; however, most homes today use features from both ends of the spectrum. On the formal end of the range is Provincial architecture. 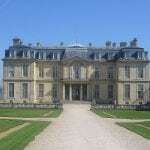 French nobles built the historic Provincial homes in the 1600’s under the reign of Louis XVI. The bold lines of the stately chateaus make quite an impression in contrast with the French landscape. Typically, the homes are two stories, and have a square footprint and symmetrical details on the front elevation. Dormer windows, often arched, that rise out of the second story roof line are a distinguishing hallmark. The warmer, more rustic, side of French Country architecture hails from the farmlands of Normandy. Here farmers honed the beauty of informal living. Charming half-timbered homes are reminiscent of storybook cottages. Traditional homes in the French countryside are also known for their towers which were originally grain silos attached to the main living quarters. While the homes of Normandy use arched windows, much like Provincial homes, their front elevation is often asymmetrical. 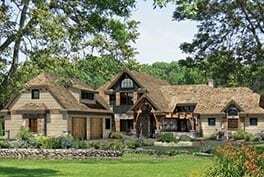 Since timber framing has been a traditional building method of building in France since the 1400s, it is fitting to pair timber framing with the French Country architectural style. 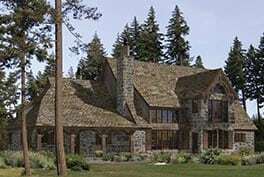 Both the elegance of the Provincial style and the rustic warmth of Normandy home’s can be achieved with timber framing. 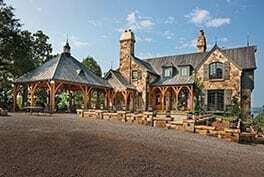 Over the years, Riverbend has been involved in helping many clients create their dream French Country timber frame home. We even have several of them to inspire you in our photo gallery. 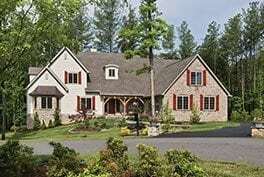 Are you ready to say Oui to a timber frame home inspired by this classic style? Explore our French Country design concepts.